Before crossing the state line into Maryland from West Virginia, US 219 follows a high ridge overlooking the mountains and valleys of Tucker County to the west. During the first weeks of October, the colors of the fall foliage create a brilliant sea of red, oranges, and yellows over the rugged landscape of the Alleghenies. 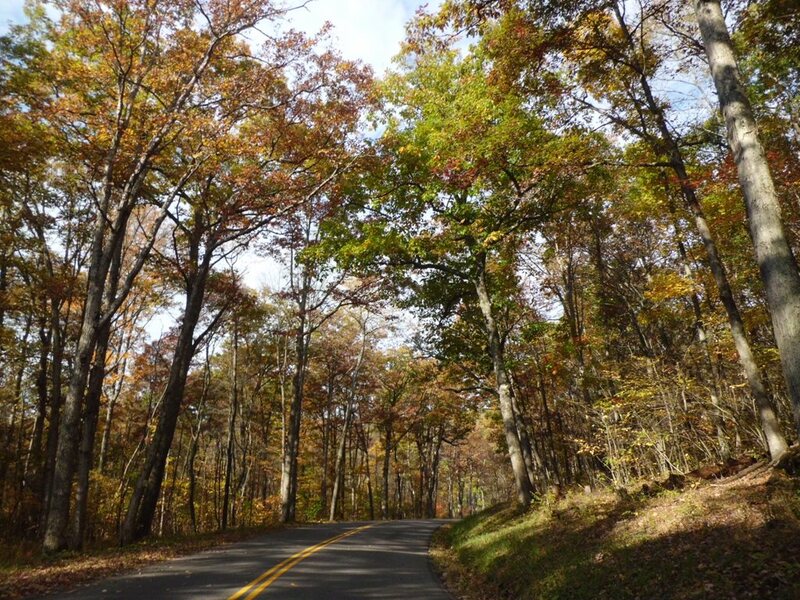 Driving along 219 and through the forest, the leaves create not only a vibrant canopy, but give new life to the forest floor, adding those blazing hues to the ordinary greens and browns. Autumn foliage along U.S. Route 219 near Backbone Mountain. Photo by Dan Schultz. Along this stretch of 219, ascending Backbone Mountain from the old coal town of Thomas, WV–whose neat rows of turn-of-the-century buildings sit like perched spectators above the north fork of the Blackwater River–its easy to miss the nondescript Forest Service sign marking “MD High Point.” This is about 8.5 miles north of Thomas on 219, or 5.7 miles south of Red House, if coming from Maryland. An unpaved, old dirt logging road is found by the sign here, following the mountain up and away from the old US 219, to where drivers can park their cars. The WV side of the mountain is National Forest Land, part of almost a million acres of the Monongahela National Forest that dominates the eastern part of the state. Interestingly, Backbone Mountain also forms a part of the Eastern Continental Divide–rivers to the east of it flow to the Atlantic ocean, and those west of it belong to the Gulf of Mexico watershed. View from summit of Backbone Mountain, looking toward Preston County, WV. Photo by Dan Schultz. A trail too rugged for most cars continues up the ridge. It is marked by ugly, red, spray painted HPs–High Point–on the trees, as you wind your way up the moderately steep trail. Fall is a perfect time of year for the short, mile-long hike to the summit. The air is cool, there are less pestering insects, and the colorful foliage creates an extraordinary atmosphere for the walk. Soon enough, the spray painted HPs give way to delicately placed rock pyramids, or cairns, as one nears the summit, Hoye-Crest. This is private land, once owned by the Western Maryland Railway, which was running a line down to Thomas and through the Blackwater Canyon, soon after the turn of century. Today, the area immediately around the Hoye-Crest is said to be owned by a coal company, who continue to allow access for hikers to the summit. Hoye-Crest summit marker on Backbone Mountain. Photo by Dan Schultz. The vegetation is mostly clear around the summit–presumably to give hikers a better view of the surrounding landscape. 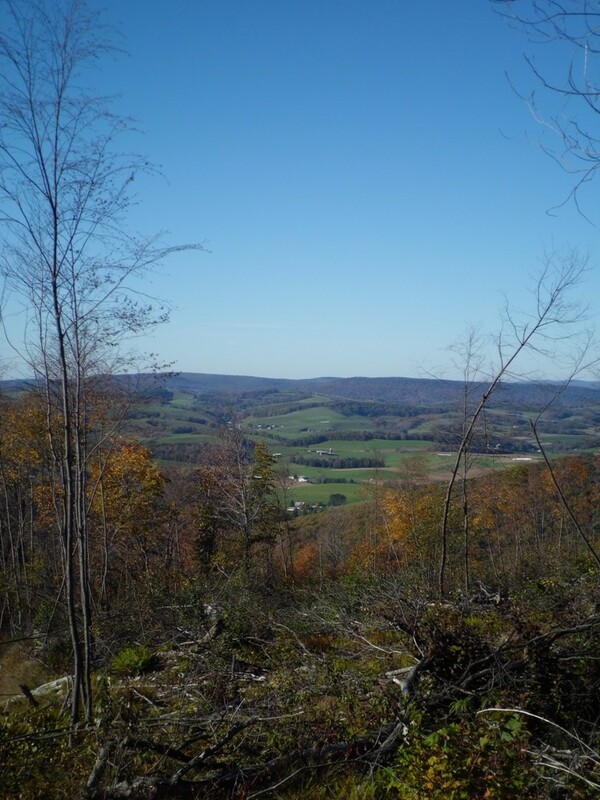 From this spot you can look out on the autumnal forests and pristine pastures of Maryland and West Virginia. 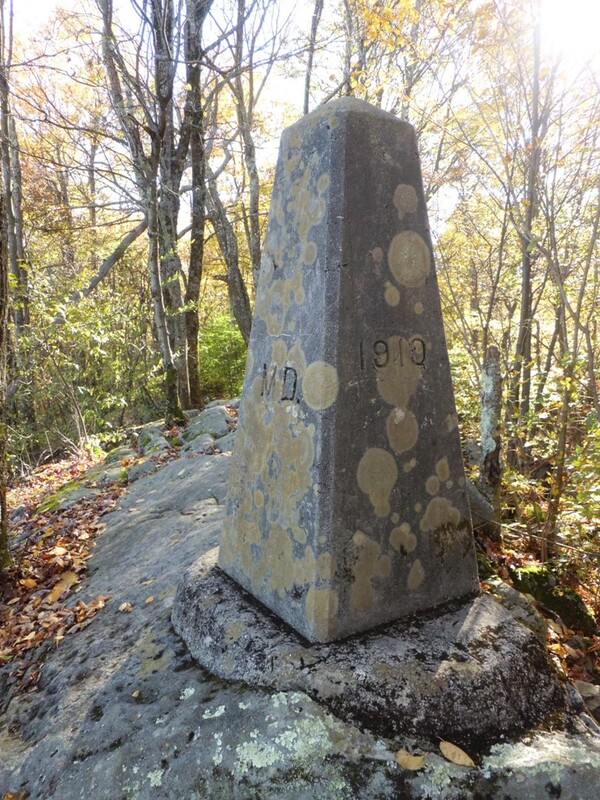 The actual summit is marked by a sign and a gigantic rock cairn, and there is a mailbox, too, so that you can mail yourself something from this high point. 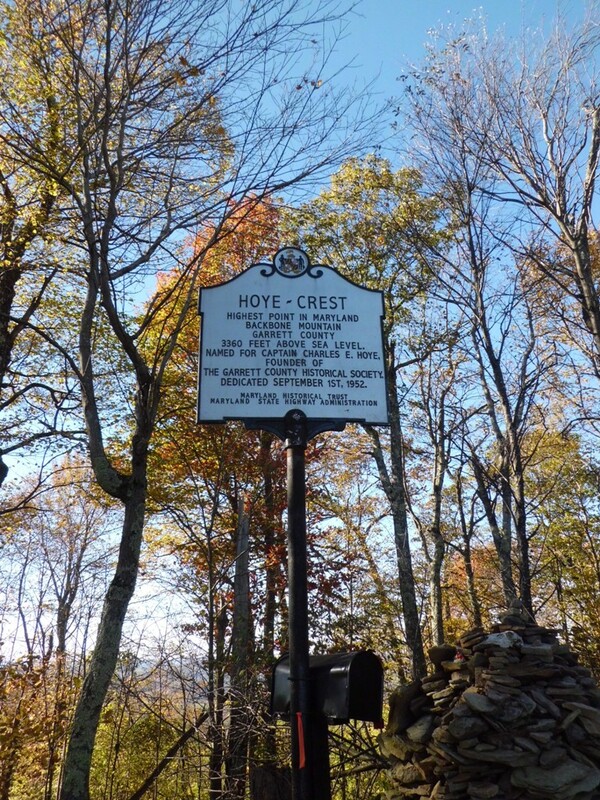 The sign informs visitors that the Hoye-Crest is the highest point in Maryland, at 3,360 feet. The summit is “named for Captain Charles E. Hoye, founder of the Garrett County Historical Society. Dedicated September 1, 1952.” A picnic table also sits upon the summit, inviting hikers to sit, rest, and eat while enjoying the fresh mountain air. West Virginia-Maryland boundary marker, no. 3. Photo by Dan Schultz. Returning down the trail hikers can see a granite stone monument that marks the official boundary line between Maryland and West Virginia. It is inscribed with the names of the surveyors, and the date, 1910. This was the year the Supreme Court made a ruling on a long standing boundary dispute between the two states. They then ordered official surveyors to mark this boundary with steles like the one found near the Hoye-Crest.